In a flash 6 weeks was over. 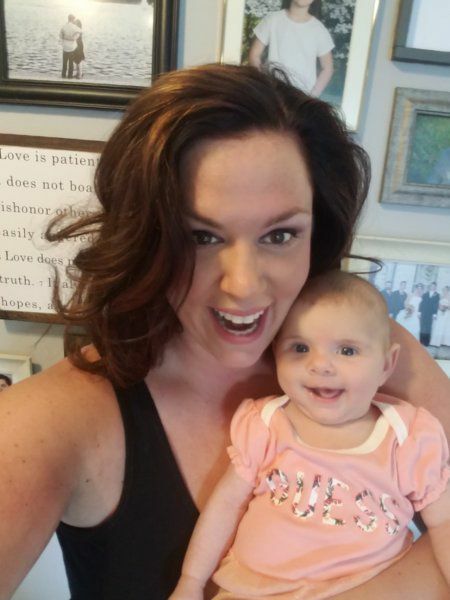 While I routinely dreamt of working out and at 4 weeks postpartum I got "caught" bringing the dumbells into the house by my husband I will also freely say how much I loved not setting the alarm for 4am! Ms. Mackenzie was born on July 18th at 7lb 9oz of beautiful and we've been wrapped around her tiny finger ever since. Becoming a family of 5 has been the most exciting adventure for our family. With a big sister and brother who play rock, paper, scissors over who gets to hold her first and the endless love of her parents and pets too, Mackenzie's off to a great start! Last week I was cleared for exercise by my Doctor and I contemplated driving straight from there to the gym! Ha! But seriously, the alarm was set for the very next morning. The 4 AM alarm is now set for 330. It works out perfectly with Mackenzie's feeding schedule. She's ready to nurse, I'm ready to leave for my workout and just like before, this Momma and Wife is gone and back again before the day begins. Making time for myself and my health a priority. Making time to be the best me I can be for my family. Though I know it wasn't planned, it felt like a present that my 1st day back included front and back squats. Squatting for the 1st time since my 1st trimester really was exciting! I opted to go 2x a week for these first two weeks back and will increase to 3 and 4 times a week over this next month. I've been working on tracking my food at home and while I'm back in most of my pre-pregnancy clothes this postpartum body is different than before. While they haven't been taken yet, I'm sure my measurements reflect that. Currently I'm signed up to participate in the upcoming Lurong Championship Challenge. 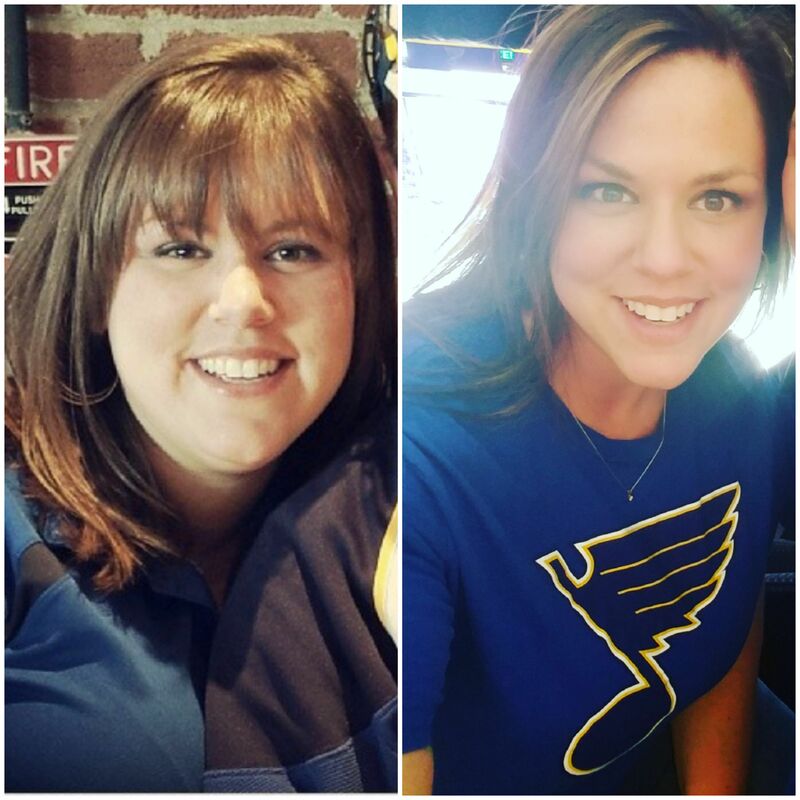 It is my hope that hitting reset on my nutrition with some of my fellow athletes will jump start my continued weightloss and set me on the right track to see some major change over the course of the next few months. 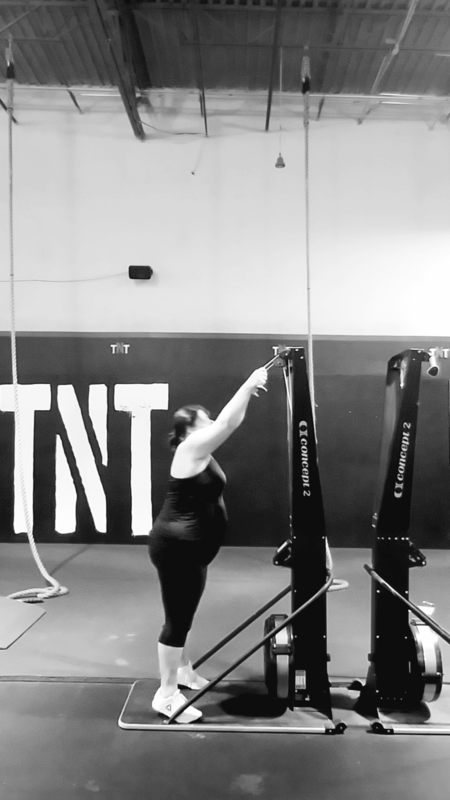 Being back at CrossFit TNT feels great. I'm starting over again. Looking at my weights lifted, row times, etc. as a baseline. Choosing not to feel defeated when things look much different than before but rather excited to climb back up to where I was and more. 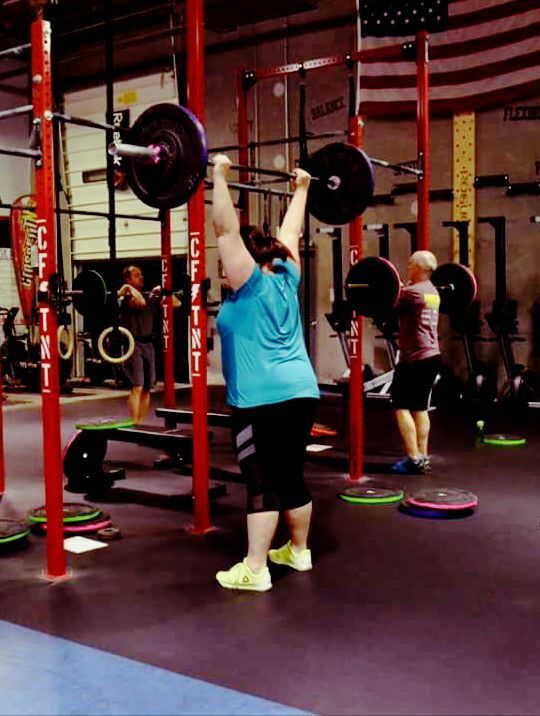 This week I was doing air squats during a workout prescribed for pistols and I scaled the scaled weight prescribed for our benchmark workout. That's ok. I have to start from somewhere and right where I'm at is it! Wherever you are with your fitness journey, sitting at home planning to start next week or a seasoned "really good exerciser" as good friend of mine would say, don't wait to set goals for yourself. Make it fun and see yourself grow in the process. 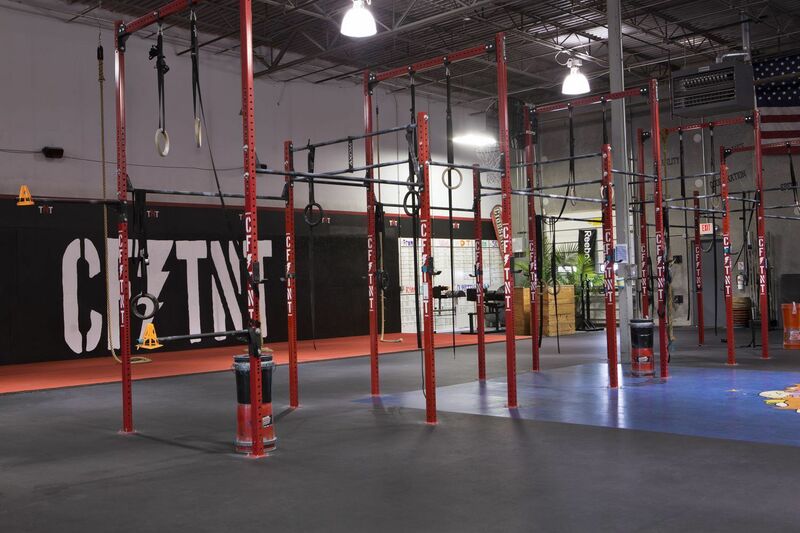 Come check us out at CrossFit TNT. Age and ability aside, there is seriously something for everyone! Wrapping up my daughter's and my #babyandmewods with sled pulls and farmer carries was a great last test of mental and physical endurance before labor, delivery and recovery. I guess I can say that I tapped out near the end of 36 weeks pregnant. I am willing to admit, I didn't think that day would come...believing I would feel capable of a solid workout up until delivery seemingly overnight transformed into certainty I cannot. It's now that I point out to anyone reading that a great thing has happened. Life has been created and my fitness routine has been maintained! In regards to working out while pregnant, what a different experience this pregnancy has been from my other two. I know all too well how fast the 1st weeks fly by. I'm going to soak up every minute! After the next 6 to 8 weeks I'll be back at CrossFit TNT ready to lift all the things!! It will be new again and I don't know what to expect from my body. I do know this, while it will be a whole new kind of beginning at the gym, all of the training hours I've put in over the last three years have brought me to this point and will carry me through the starting line again. 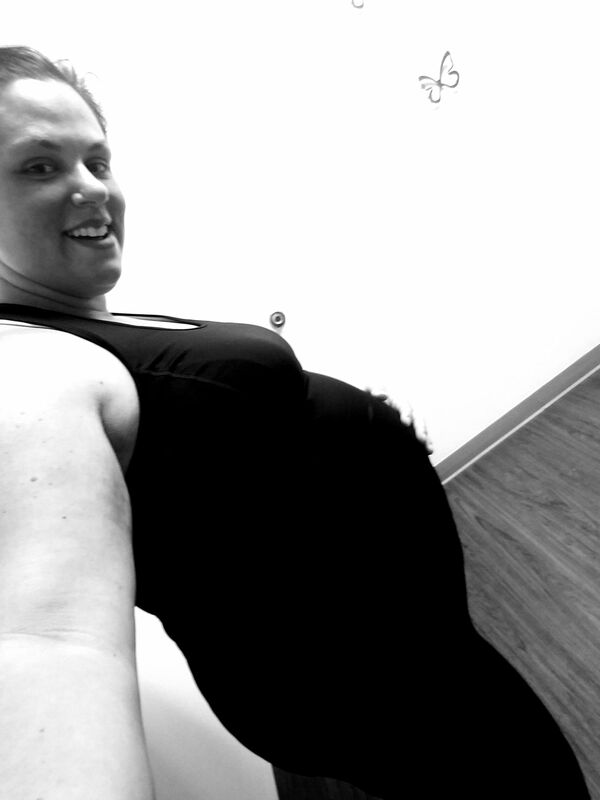 I can't wait to share our baby girl's arrival and come back ready to rock out some weight loss and PRs. How great to have the direction of TNT's amazing coaches and support of my friends and peers at CrossFit when I return! Listening to our bodies tell us what's best is a simple concept that should be easy to follow. So often though, we don't listen. We push when we shouldn't or not at all when we have so much left to give. In an environment like CrossFit TNT we have the wisdom of our Coaching Team to guide us when we are in doubt. 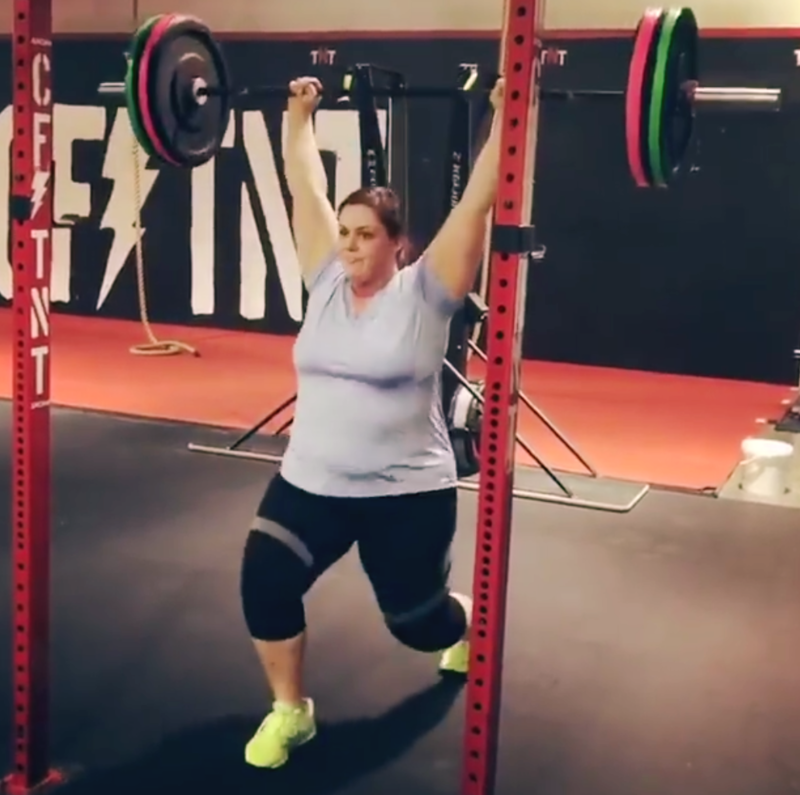 They redirect us to scaled and alternate movements when as individuals we may be working to recover from injury, facing a day that needs more active recovery than intense training or in my case, are 8 months pregnant! Taking the time to listen to our bodies and our coaches keeps us productive and moving safely. Last week, baby and I were only able to work out 1 day. On Tuesday, in addition to the days cardio, I completed 5 sets of 9 Deadlifts, 40 Hang Power Cleans and 40 Push Jerks. It felt great...moderate weights and the burn of a good cardio workout! It wasn't long before I could feel it-the soreness that comes from a good push. In my case though, I was totally wiped out! While I gave my best on Tuesday, I literally failed to get up with my alarm the whole rest of the week. Baby said sleep, and as we've heard Coach Oscar and others tell us often, sleep and good nutrition are just as important to our overall success as our fitness routine. SO, I slept. I would have liked to workout more last week but, I am just so happy that baby and I are healthy and able to push when energy allows and respect the need to rest when necessary. This week was awesome! 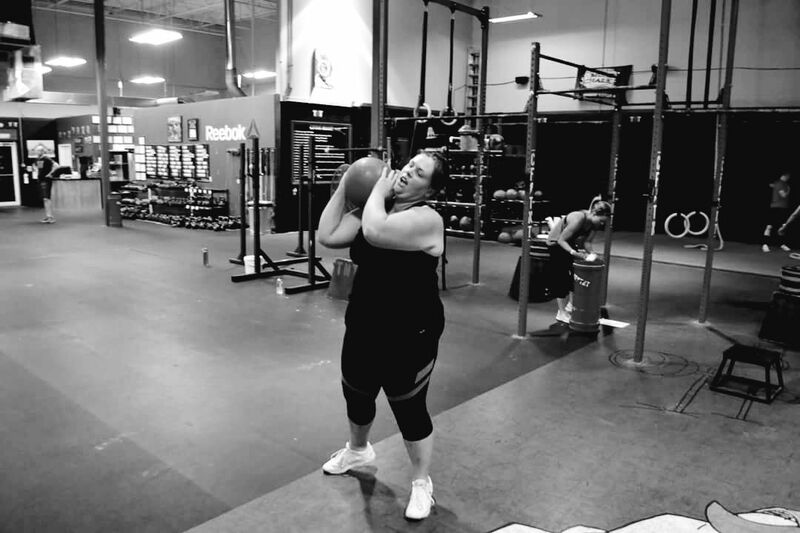 Monday and Thursday were packed with cardio, wall balls, step ups, dumbbell work and more. So much was scaled and that is A-OK with me! Baby girl and I are at the cusp of 36 weeks and we just keep moving along, pushing when we can, resting when we need and trusting in our coaches and doctor to guide us along the way. I CAN'T believe meeting our sweet girl is just around the corner! Whatever life's excitement or stressors are for you right now one thing we can all choose is to make maintaining and improving our health a priority. Come check out one of our programs at TNT! There is something for you too! 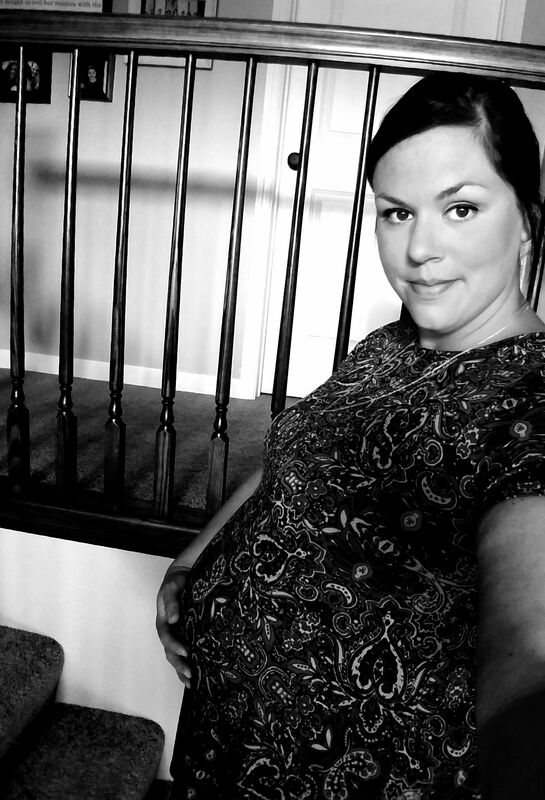 Here I am at 32 weeks pregnant. My feet are starting to swell, the veins in my legs look like I lost a fight and my physical disposition doesn't reflect the overall glow of pregnancy so many expect to see. I feel huge, tired and nauseous. I'm thankful the urge to nest came as early as it did because Lord knows it's easier to rearrange whole rooms of the house when you can still see your feet. But...most of all, I'm SO very excited to meet our new baby girl!! As this is our 3rd baby, I know all too well the second I hold our baby in my arms the feelings of discomfort, constant indigestion, occasional vomiting and swelling will all be forgotten. At the end of this uncomfortable road is the most amazing thing...a whole new human being, our baby girl! Nothing could be better. While so many things about this experience remain the same as my last 2 pregnancies one thing is drastically different. I have maintained a fitness routine. It changes every week. I scale things a little more, sub out another movement for one I can still effectively do or lift less than I know I otherwise could to be safe for baby. As I continue to scale the workout, I am thankful for what I can do and that I've maintained the dedication to do it. Last week I was able to get in workouts on Mon, Wed, and Fri. This week, with a crazy schedule, I was able to make it in twice. Coach Oscar's programming has kept us on our toes. 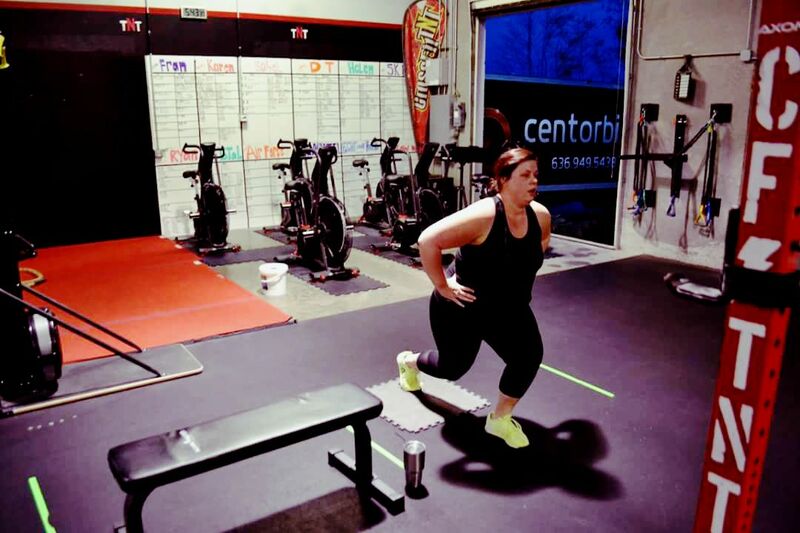 That programming and our coaches ever ready ability to tailor the workout to fit our physical restrictions makes it easy to feel comfortable and confident both in the gym and completing the lifts, rowing, biking, etc. I'm also enjoying continuing to gear up for post-delivery menus and meal prepping. For now, that's all. I'm happy to be sharing this part of my story through my blog. I'm hopeful that inspiration can be found and through reading you will see TNT has something for everyone whether you have no restrictions or many. Come check us out! Almost 30 weeks have come and gone. We will be meeting our sweet baby girl before we know it! With just 10 short weeks of pregnancy and Baby and Me WOD's left, it's an understatement to say I'm in nesting mode. Always trying to squeeze so much into every day. I've been struggling past my lack of energy to get as many workouts in as I can, knowing that when our sweet girl arrives it will be several weeks before I'm able to workout. I've been thinking more about meal prepping for when baby is born. It's important to me to set myself up for a successful jump start once we are all home, starting our new journey as a family of 5! It's time to prep freezer meals I can throw in the crock pot and plan what fresh foods I'll need in advance. The time to make the menus is now! I may even cave and get an Instapot. I don't plan to go extreme Whole 30 but start with a clean eating reset and get my nutrition in line as I'm home recovering. I'm sure that will include seeking out knowledge and guidance from Coach Rochelle and Coach Oscar as all things CrossFit and nutrition do! What better way to prepare my body to hit the gym hard and get back in gear once released by my doctor. I am looking forward to pushing hard in my cardiovascular work and getting my hands on my bar with no restrictions! ALL the squats! It will be amazing! 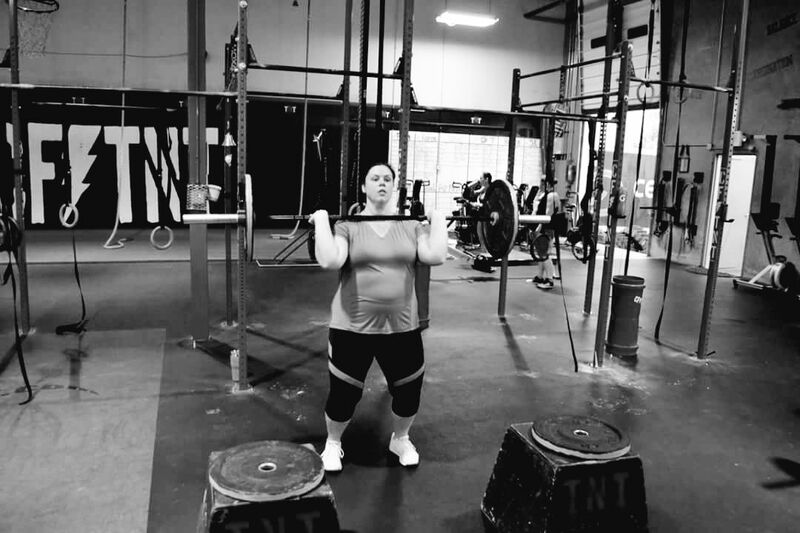 Three years ago this week, I walked into CrossFit TNT for the very first time. I sat through a nutrition seminar, got on the scale (which was awful) and had my measurements taken. In the time since, CrossFit has become a part of my daily life. I'm forever thankful that Rochelle and I met by divine intervention one day at our kids gymnastics class. That one moment set into motion such a change in my life! Because of all I have learned and accomplished over the last 3 years, I feel confident and prepared to send the 15 pounds I have gained this pregnancy on its way once baby girl is here. 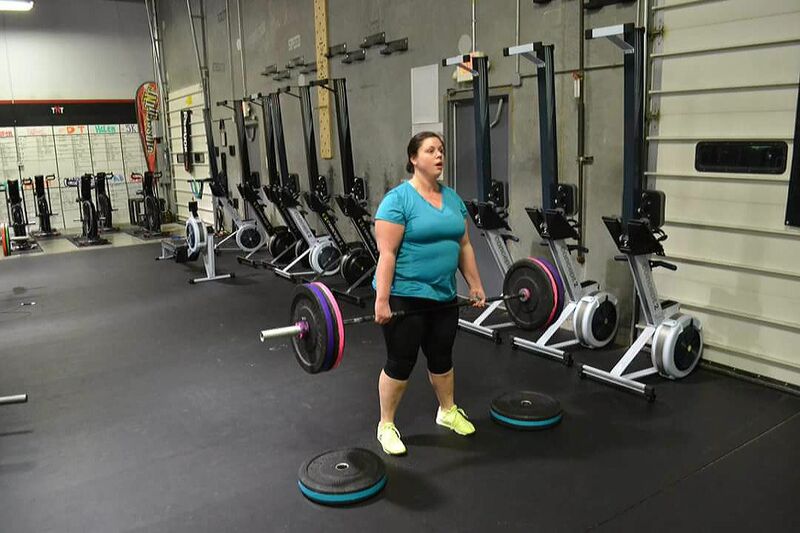 I know that with CrossFit TNT I'm equipped with the support, network and experts I need to be successful. Most importantly, I'm equipped with motivation and dedication! I'm so glad to be sharing this time with you all. Hoping you can find inspiration through it all. Come check us out at TNT! There is programming available for everyone no matter your age and restrictions!